The atomic bomb has captivated the public since the first detonation. In particular, science fiction has embraced this powerful and unpredictable weapon. It's appeared frequently in sci-fi movies and TV. Here are nine of them. 1. Dr. Strangelove - In this cold war comedy, an insane US general orders a plane to drop a nuclear bomb on Russia and trigger World War III. 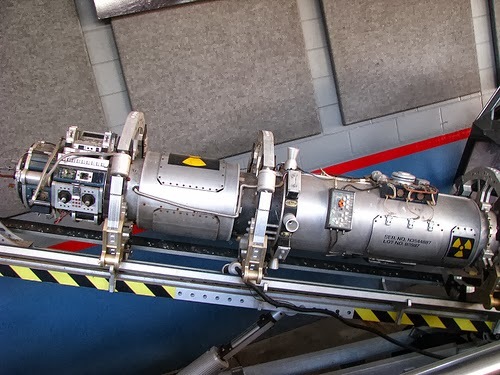 This is one of the only nuclear bombs in history that gets ridden like a bucking bronco. 2. Beneath the Planet of the Apes - When a spaceship crash-lands on a planet where simians rule, the astronauts find a race of mutant humans living beneath the earth. The mutants worship an unexploded nuclear bomb. I don't know what's scarier -the bomb or their skinless faces. 3. 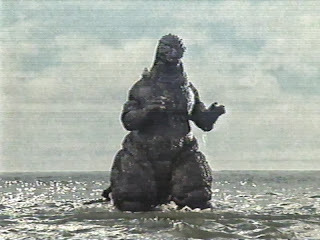 Godzilla - A nuclear bomb test awakens a hibernating dinosaur and gives it nuclear breath. Japan revisited the horrific bombing of Hiroshima when they came up with this giant radioactive monster: he's a nuclear bomb that can walk and eats people. 4. 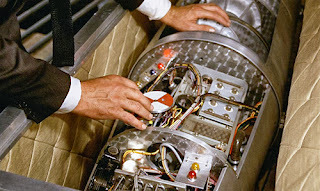 Goldfinger - In this classic movie, secret agent James Bond tries to stop the evil Goldfinger from invading Fort Knox. Goldfinger plans to set off a nuclear bomb in Fort Knox, irradiating the gold and making it useless, causing economic chaos. Trivia: In the original novel, Goldfinger's plan was to steal the gold from Fort Knox, but the screenwriter thought that was too unbelievable. 5. Indiana Jones and the Kingdom of the Crystal Skull - Indiana Jones is chased through the desert by bad guys, and gets trapped in an atomic test site. His only hope is hiding in a refrigerator. 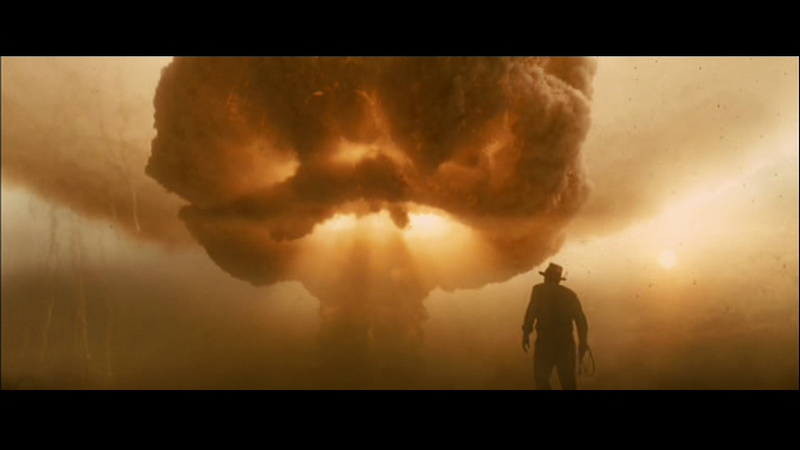 The nuclear bomb goes off, but thanks to the lead-lined fridge, Indy is okay. Trivia: The phrase "nuking the fridge" has become a term used for when a movie series goes awry. 6. Lost -In this mysterious series, an Incident causes an atmospheric anomaly that crashes a plane onto an enigmatic island. In order to prevent the Incident, the survivors travel back in time to set off a nuclear bomb, and prevent the Incident from ever taking place. The bomb goes off, creating an alternate timeline where the plane never crashed...or did it? Trivia: "Jughead" is the code name for a real nuclear device intended to be detonated at Bikini Atoll in 1954. 7. Armageddon - An asteroid is headed for Earth, and will wipe out Mankind. The only way to stop it is to explode a nuclear bomb on the asteroid. Thanks to Bruce Willis and his crew, they set off the nuke and save the world, proving Willis is the only thing more powerful than a nuke. 8. 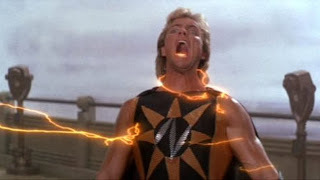 Superman IV: The Quest for Peace - Lex Luthor wants to wipe out Superman, and he's using hair and a nuke to do it. A nuclear bomb combined with Superman's DNA creates the supervillain Nuclear Man. Somehow, the nuke gives Nuclear Man Superman's powers of strength and flight, along with a lightning-filled mouth and radioactive fingernails. Trivia: Christopher Reeve refused to make another Superman movie unless it dealt with nuclear disarmament, something he felt strongly about. 9. Independence Day - An alien invasion comes close to wiping out humanity, and its fighters and motherships are protected by an impenetrable force field. The US government tries launching a nuclear bomb at the alien mothership. Unfortunately, the bomb doesn't even scratch the paint, but a computer virus does the job. It turns out a Mac is more powerful than a nuclear bomb. Which is your favorite nuke? Can you name any other famous nukes? In the Star Trek: Deep Space Nine "Little Green Men," this was also used as Quark's means to return to his own future after he, his brother and Starfleet Academy-bound Nog wind up in the past and become the Roswell aliens. And just because, I will also reference Chekov's famed "nuclear wessels." 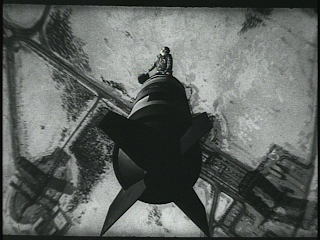 The Avengers and Dark Knight Rises both featured a hero having to dispose of a nuclear weapon but I don't think any of those will be as memorable as Dr. Strangelove. Yee-hah! It certainly wouldn't be the one from Indiana Jones. His survival in the fridge was too unbelievable. Great list! Dr. Strangelove is one of my favorite, big Peter Sellers fan! Just because I watched Pacific Rim last night I include it! I've always wanted to see Dr. Strangelove. 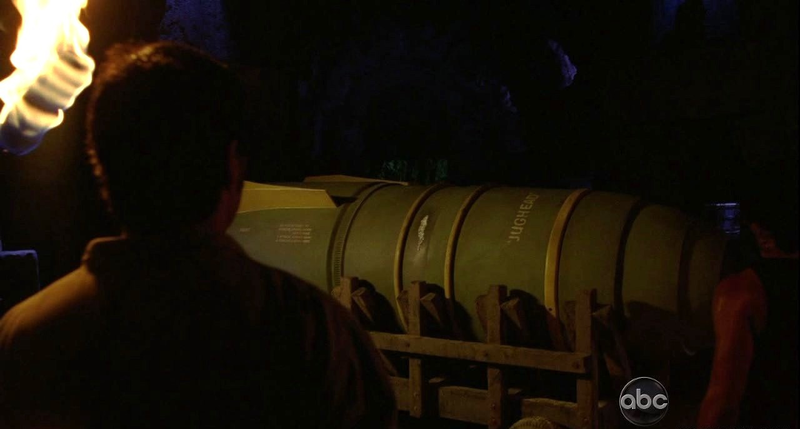 Bombs in movies scare the heck out of me. How about "Into Darkness Rises"! It would be interesting to see all the possibilities. "Eternal Sunshine of the Spotless Hologram"
"No Undiscovered Country For Old Men"